Please refer to our stock # 1128 when inquiring. 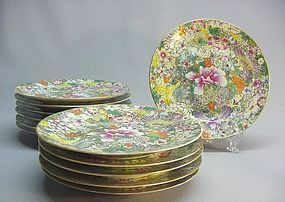 This is a set of twelve late Qing Dynasty Famille Rose Mille Fleurs (thousand flowers) plates. Each plate is 1” high and 7 1/2” in diameter. A large pink peony appears in the center of each plate; chrysanthemum, lily, hibiscus, iris and several unknown flowers fill the tops of the plates. There are Guang Xu (1875~1908) marks and three separate floral (peony) designs on the back. The workmanship is elegant. The gold edging on the rims has slightly rubbed off. Aside from this minor wear, they are in great condition. More detailed photos are available.